The Gay Gamer: The best piece of 3DS box art yet? I think so. Quite a few pieces of 3DS box art have impressed me since the system was launched early last year. Among them: The box art created for Beyond the Labyrinth and Extreme Escape Adventure: Good People Die (aka Zero Escape: Virtue's Last Reward). I think the piece of cover art below may have them both beat, to tell you the truth. What game was it created for, you ask? Fire Emblem: Kakusei (aka Fire Emblem: Awakening). I'm not entirely in love with the game's logo, although I do appreciate its rather understated elegance. The illustration that resides behind said logo, though, is where it's at. I especially love its diagonal focus and movement. 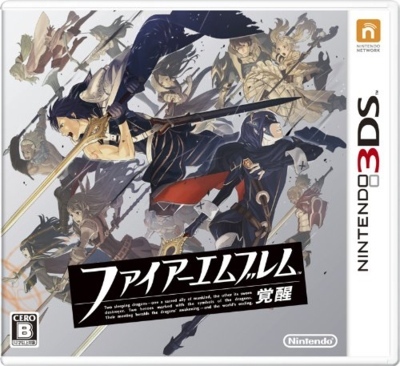 This fabulous piece of cover art will appear on Japanese store shelves on April 19. Here's hoping both the game and the above-mentioned box art (and maybe this bundle, too) make it out of Japan and into other territories sooner than later. I hear this version of Fire Emblem will allow you to turn off perma death! If that is true, then I'll definitely get the game! It's the one aspect of Fire Emblem that is a barrier for me - in the last DS Fire Emblem game I found sound of the missions very difficult and when my people started dying I just got overly frustrated with the game and gave up on it. I wonder when the Nintendo network stuff will start appearing in the US/Euro regions? That cover art is amazing, and I'll bet the US mucks it up. But I'm with you on the diagonal. Love that! Justin: Yeah, I'm guessing NOA will muck it up, too. They'll probably replace this amazing piece of art with some kind of generic-looking anime characters. Oh, well, as long as we get the game I won't care ... too much. Been too long since my last comment but I have to say, I am liking that box art. That's OK, motherplayer. I haven't exactly been posting much lately either. I think I'm finally getting back to normal, though, so expect to see regular, daily posts from now on. hehe that doesn't surprise me. Fire Emblem is a game most people aren't really aware of or haven't played (or just not think of) unless they already know about it. diaglyph: Oh, I'm well aware of Fire Emblem, I just haven't spent much time with any of the series' games. Which is weird, as I love tactical RPGs. Anyway, I look forward to giving the series a try with this one, should it be released in the US. If not, maybe I'll pick up the DS or Wii version. If memory serves me, I don't believe FF Tactics had perma death, or are you talking about the original PS1 Tactics? That's the one thing that draws me to Fire Emblem - permanence. I like the idea that my little dudes out on the battlefield mean more to me than just the faceless scrubs of, say, Advance Wars. I like to see my mistakes mean something in a video game. I admit it's difficult to always get right, but when it's done well - like in Fire Emblem :D - it feels great. I'm talking the original PS1 Tactics, diaglyph -- which I *believe* had permadeath, but I have to admit it's been quite a while since I've played the game. I understand how permadeath can make your decision be more meaningful (and yes it does make you feel good to complete it without a death) but if you are not that good a strategist or player, it gets very frustrating and annoying! I'd like to play the game at my level of competency. If you (the general you) can play the game with that difficulty of permadeath, then that's great. I can't - it makes the game overly difficult for me. Oh, I hear you, diaglyph. I really think the folks who design games like Fire Emblem should allow gamers to choose their options in cases like permadeath. It certainly would serve to make the game accessible to more people! And I can't see why it should be an issue to make permadeath an option (directed at devs in general). I don't mind if permadeath is ON by default - as long as I can turn it off :) For the players who like it, they don't have to worry about it and continue playing with the default option. Yeah, I also don't understand why it isn't often an option, diaglyph. I have a feeling it's because the devs -- or because the publisher, Nintendo in this case -- are worried that giving people too many options will confuse them.